My name is Gill Slater and I'm a Cheshire based graphic designer, with over 20 years experience, within the packaging industry. I very much enjoy crafts of all sorts, but especially paper crafts. 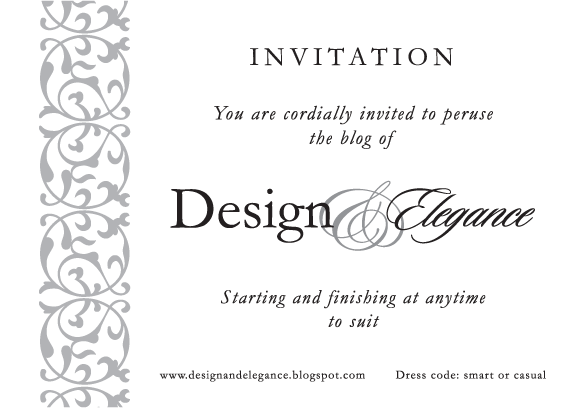 I've also been blogging over at Design and Doodles and enjoy sharing my creativity and inspirations with all who visit. I was asked, this year if I could help out with designing and producing some wedding stationery for my partner's daughter. I thoroughly enjoyed being involved with such a task, this was totally up my street! I have a, not so secret, passion for all sorts of stationery. I ended up designing and producing all the stationery that the Bride and Groom required for the day of the wedding. The Bride loved what I had done and thought it was 'amazing'. A guest couple at this wedding were also impressed with my work that I am now happily commissioned to do their wedding stationery as well. This work is so enjoyable that, here at Design and Elegance, I would like to share examples of the commissioned work I have been involved in, as well as bring you some of my new ideas and designs for possible future weddings and occasions.